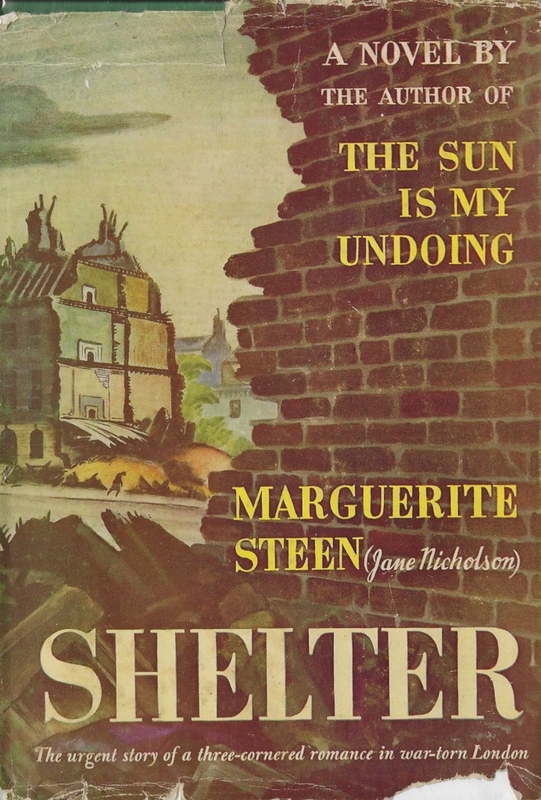 Shelter by Marguerite Steen ~ 1941. This edition: Sun Dial Press, 1942. Originally published under the pseudonym Jane Nicholson. Hardcover. 241 pages. I followed my reading of Frances Faviell’s superb London Blitz memoir, A Chelsea Concerto, with this rather unusually structured novel covering the exact same time period, in the same London borough. It’s an interesting novel, and certainly not a bad novel, but I rather wonder what I would have made of it if it hadn’t been so much related to the Faviell memoir in setting and time period. The writing itself is much more than competent; I would go so far as to call it “fine”, in the highest-praise sense of the term. This said, I suspect I got more out of Shelter as a companion piece than I would have if it were a stand-alone read, for it is a bit of a jumble, written in what I would term a modestly “experimental” style, sections of straightforward storytelling interspersed with random vignettes, the thoughts of various unnamed characters, glimpses of newsreel dialogue, and what one must assume are the author’s own pithy comments, not directly related to her erstwhile story-plot, that of a troubled marriage which has turned into a delicately balanced ménage à trois. Highbrow Louise is married to not-highbrow (but not quite lowbrow, either) Jos, and they are reasonably content within their 7-year-old relationship. Or so Louise thinks, until it becomes apparent that Jos has become infatuated with the fragile (and possibly hypochondriac?) Camma, who returns his interest with bells on. Jos seems to be the kind of chap who hates fuss; he’d like to keep both wife and mistress, and the fact that the two women are well aware of each other, and carry on a brittle sort of almost-friendship, seems to indicate that his delicate balancing act may be succeeding. But then Louise breaks the news: she’s pregnant. Now what? The relationship angle of the plot runs parallel to the wider story of a city, country and way of life in peril, and as dreadful thing succeeds dreadful thing one is left at a loss as to anticipate how – or if! – the author is going to resolve, if not the major problem of surviving the war, at the very least her teetering love triangle. By removing one of the principles, as it turns out, in a decidedly final way. 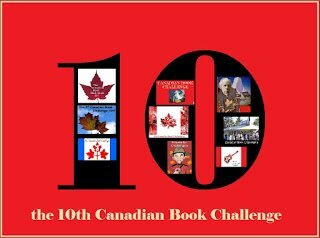 Well, the book is readily available in the secondhand trade, and has recently been released as an e-book, so it’s not too hard to come by. My own first awareness of it was when I came across it at a small used book store I occasionally frequent and decided to gamble my $5 that it would be an interesting read. It is all of that, but I hesitate to recommend it, because despite the writer’s sure hand, Shelter seems to me to be missing that elusive something which turns a perfectly adequate novel into something extra-special. 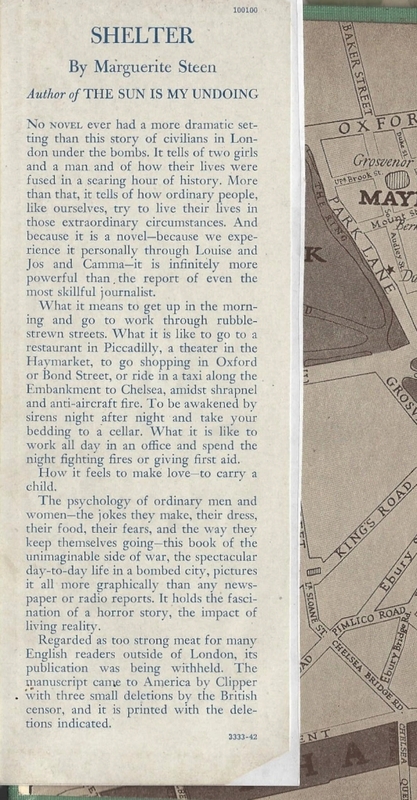 For further interest, here’s a look at the dramatic promotional blurb from the American-edition dust jacket, as well as a random scan of one of the vignette sections. Marguerite Steen was adopted as a child and educated at a private school and at Kendal High School. At age 19, she became a teacher, but abandoned that career after three years and moved to London in an effort to find work in the theater. After failing at that, she became a dance teacher in the Yorkshire schools. This job enabled her to spend long periods travelling in France and Spain. In 1921, she joined the drama company of Fred Terry and Julia Neilson, based at The Strand Theatre in London, and spent three years touring with them. She was befriended by Fred’s sister Ellen Terry, who suggested that she try to write a novel during a period of unemployment. 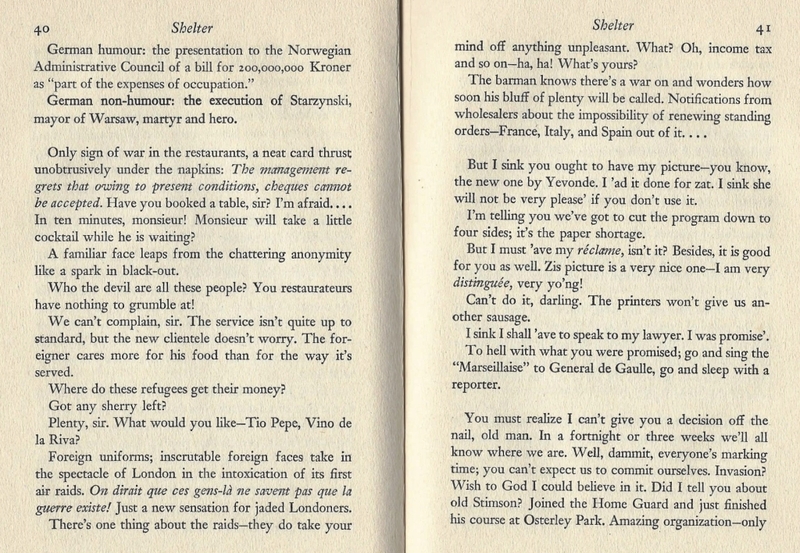 Marguerite’s first book, The Gilt Cage, was published in 1927. She went on to become a well-known author of some 40 books, mostly historical novels, having her greatest popularity in the 1930s and 1940s. She wrote biographies of the Terrys and of her friend Hugh Walpole, as well as that of 18th-century writer and actress Mary Robinson. Among her bestsellers were Matador (1934), for which she drew on her love of Spain, and The Sun Is My Undoing (1941). 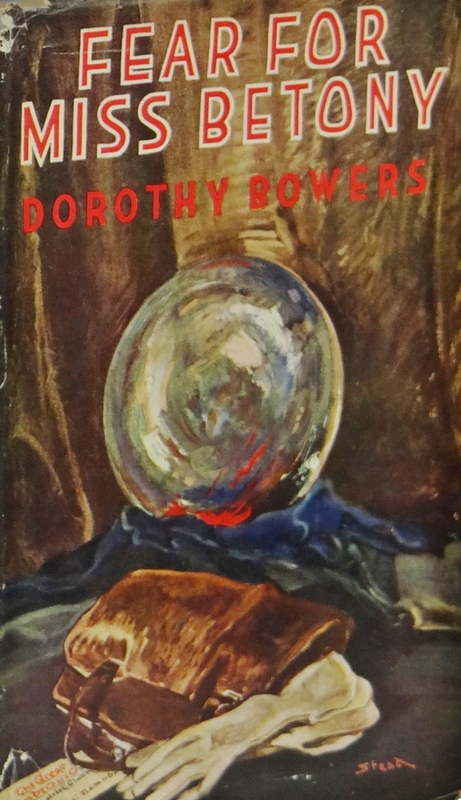 She also produced two volumes of autobiography, Looking Glass (1966) and Pier Glass (1968), which provide insights into the English creative set of the 1920s to 1950s. She shared a home with artist Sir William Nicholson for about 15 years and wrote his biography as well. In 1951, she was elected a Fellow of the Royal Society of Literature. I’ve just finished something of a mini-binge of World War II-era spy thrillers, with the first two of what would turn into a handsome list of espionage and suspense thrillers by Helen MacInnes. 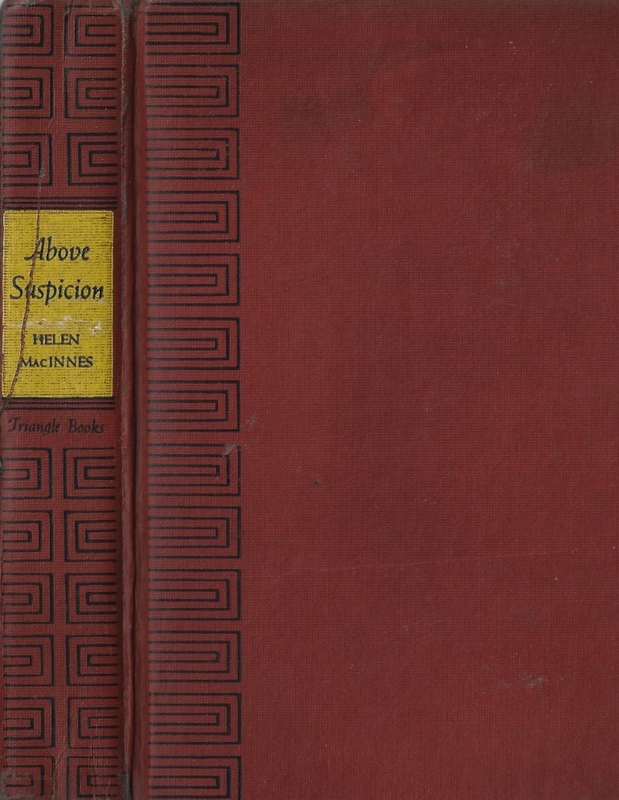 Above Suspicion was the first, and published in 1941 in the opening moves of what was to become the prolonged agony of the Second Great War, its urgent and foreboding tone rocketed it to bestseller heights. 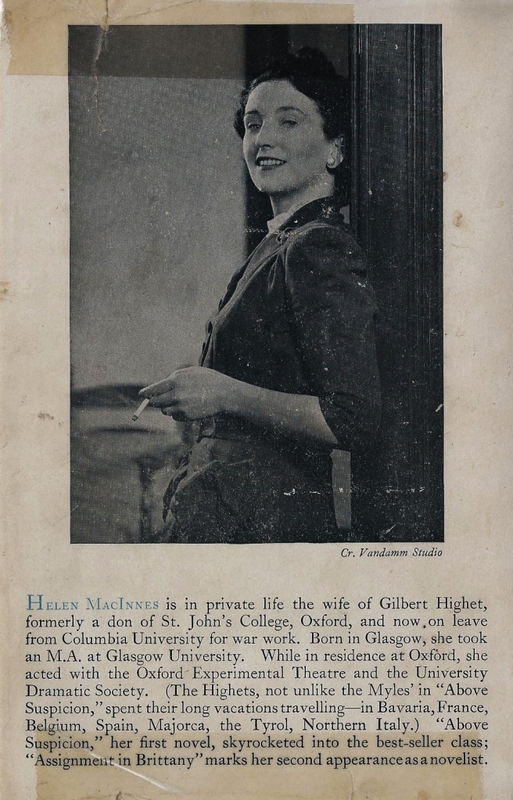 MacInnes followed her first novel by another even more topically urgent and dark, Assignment in Brittany, in 1942. Though definitely dated, these suspense novels are decidedly still very readable today, made even more enthralling by the fact that we know what happened in the years after, while MacInnes and her heroic characters are facing a tremendous and forbidding Great Unknown. I’m going to give brief sketches of both in two hundred word snapshots, if I can condense them so tightly – with the strong recommendation that you discover these for yourself if you feel that these might be your thing. These two novels are excellent examples of their genre, though highly dramatized and relying upon those inevitable unlikely coincidences and lucky breaks in order to bring them to a satisfactory conclusion. Though neither has an ending that is neatly rounded off; the settings and times don’t allow it. I have read Above Suspicion numerous times through the years, but Assignment in Brittany was new to me, and I was pleased at how engaging both of these were, even though in the first I knew the plot inside and out, and the second I guessed at rather successfully all of the way through, except for the rather heartrending (but ultimately optimistic) twist at the very end. 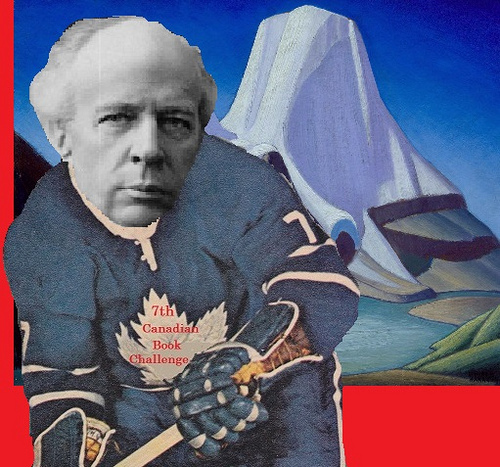 Both books were immediate bestsellers, and remain very readable – and continually in print – almost seventy-five years after their first publication. 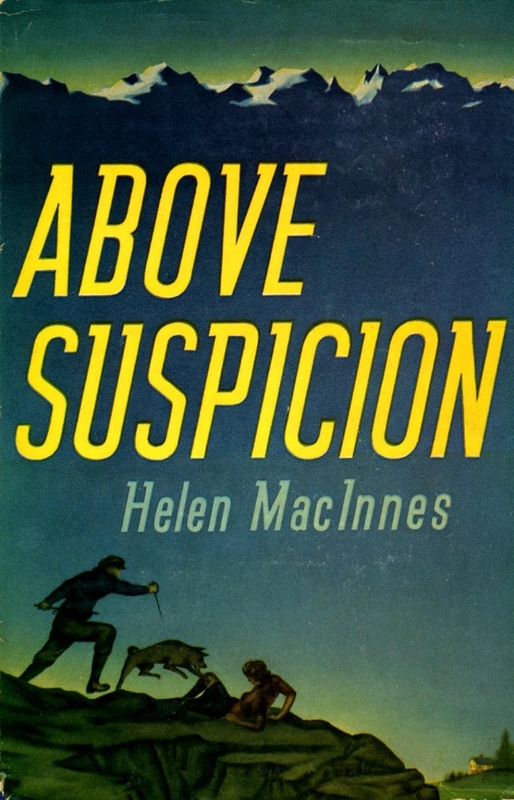 Above Suspicion by Helen MacInnes ~ 1941. This edition: Triangle Books, 1944. Hardcover. 333 pages. Young Oxford University don Richard Myles and his wife Frances are recruited to travel to Europe during summer break in order to discover what has happened to a possibly-compromised chain of British secret service agents. The premise being that the two are so innocent-seeming as to be able to wander at will, from agent to agent, following the links as identified at each contact. In their travels they run in and out of numerous sinister encounters; the Nazis are very much on the ascendant and their evil shadow looms over the lands the Myles visit on their journeyings. This dramatic vintage dust jacket illustration illustrates one of the peak moments of this suspense thriller, as the heroine is attacked by the Head Evil Nazi’s killer dog and is rescued by quick deployment of her husband’s handy-dandy sword-stick. Imminently distressing dispatch of the hound aside, isn’t this a gorgeous bit of graphic design? 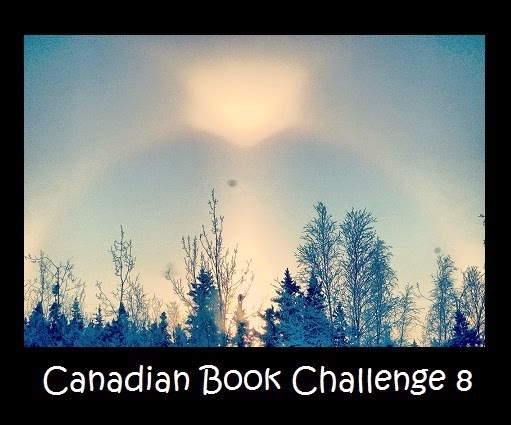 A novel made most poignant by the time of writing; the last months of peacetime shadowed by foreboding clouds of war. The author draws upon personal experience in telling her tale, and it is an interesting combination of travelogue and suspense thriller, full of asides describing the scenes in which the action is set, and philosophical musings regarding the whys and wherefores of the imminent conflict. The German psyche is searchingly probed by a very British analyst – MacInnes in the guise of her heroic (and autobiographical) married couple – and found to be both blustering and chillingly focussed on military dominion. I am fortunate enough to be the possessor of this handsomely dust-jacketed first American edition. An absolutely stellar example of vintage cover art. Wouldn’t this make an amazing wall poster? Assignment in Brittany by Helen MacInnes ~ 1942. This edition: Little, Brown & Co., 1942. Hardcover. 373 pages. 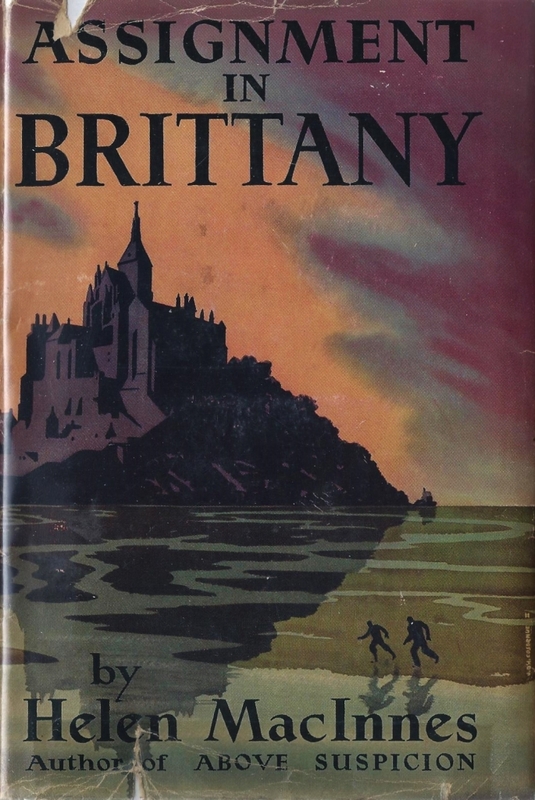 Martin Hearne is parachuted into Brittany, into the very forefront of the Nazi occupation, in the guise of his French body double, Bertrand Corlay. Many surprises await Hearne, not least of which is the discovery that his predecessor was less than forthcoming about some of his own activities before his evacuation to England via the Dunkirk debacle. For instance, his pre-marital arrangement with the neighbouring farmer’s daughter, Anne, and his estrangement from his invalid mother, who keeps strictly to her own rooms in the shared household. Who is beautiful and passionately forthcoming Elise? Why do the Nazi occupiers greet “Bertrand Corlay” with warm enthusiasm, while his fellow villagers hiss in cold disgust? An escaping American journalist sheltering in the Corlay home sets off a string of complications, most notably a dramatic trip to the medieval monastic stronghold of Mont St. Michel, situated at the end of a causeway above tidal flats of quicksand. A return to the Corlay home finds Hearne confronted by steely-eyed Teutons who have discovered their collaborator is not what he seems, in so very many ways. 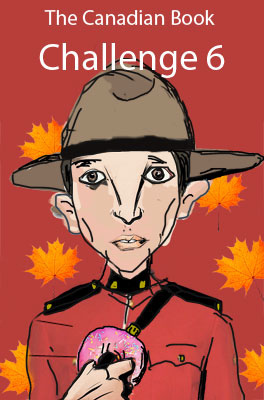 Will Hearne make it back to England with his meticulously written notes and maps, as well as his new-found love? Good dramatic stuff, rather nicely plotted for its type of thing, though with an exceedingly strong reliance on Hand of Coincidence. The evil Boche are given no ground, and the resident Bretons are depicted as cunning and stubborn survivors, insular to an astounding degree, but in the main resistant to their unwelcome occupiers by a combination of sullen non-cooperation and occasional acts of secret sabotage. An engaging period thriller, written at the time it depicts, and so a valuable snapshot of the mood and details of its moment in time as well as a very readable diversion.